Next month, we’ll see two new Beta servers open to test PvP and PvE Time-Locked Expansion (TLE) Servers. While we’ve already been informed on several occasions that restoring the EQ2 codebase back to a launch or near-launch state would be nearly impossible, but the EQ2 team want to offer players some of the “uphill both ways in the snow” experience that early EQ2 adventurers encountered. So the team are developing Time-Locked Expansion Servers which will be a sort of hybrid of some of the modern conveniences we have now, but with certain design decisions reverted or changed to provide more challenge and social interaction. To decide what restrictions should apply to these new challenge servers, the EQ2 team have already been seeking feedback from players in discussion threads on the forums. This feedback is already shaping what we’ll see in Beta, which will then further shape the final form these servers take when they launch later this year. We’ve been told to expect several in-game and on-forum Polls for players to vote on which features they think should be removed outright, time-locked, or freely allowed. To sketch out some of the team’s current subject-to-change ideas for how these TLE servers will differ from what we see on Live servers, Kander has posted TLE FAQ dated June 16th on the EQ2 Forums. We wanted to make a post this week and give you a glimpse of what we are planning for our Time-Locked Expansion Servers and what you can expect to see here in the very near future. Our current plan is to launch 2 new TLE Servers, a PvE and a PvP version. Both of these servers will have back up servers in case we need them. I am going to go over the current iteration of how they will be launching and what our plans are with them, and also list what we are considering, which we will give you, our player base, a chance to vote on with in-game polls. More on that later. What can we expect to be in place with the launch of the Time-Locked Expansion servers? The plan is to shoot for maximum nostalgia that is still within our power to make happen. So there will be many features that will not be available to players when we launch these servers and many that will never be available, especially for PvP. PvP server: no battlegrounds EVER! PvP server: no prestige housing! PvP server: no flying, leaping or gliding EVER! PvP server: No more pvp stats on gear. Procs return to items that have them. PvP server: Travel bells will be restricted, more information to be determined. There will only be ground mounts and they will have reduced ground speed. Most likely 45%/50% run speed. Only All Access Members will be able to create characters and log into the TLE-Servers. Content will be locked to classic EverQuest 2, starting areas will be Frostfang Sea and Darklight Wood. More on this later. Expansions will be voted to be unlocked at certain times by the population of the server. Majority vote 2/3 of the population. No Veteran Rewards or Veteran experience bonus. Loyalty System and daily quests will be locked to Chains of Eternity expansion. Legendary, Fabled and Mythical crits will be locked to Altar of Malice Expansion. Level agnostic dungeons will be locked to an undetermined expansion feature. No races or classes will be restricted from character create if you own them. They will all be playable at launch. Re-forging, Mercenaries, and Tradeskill apprentices will be locked to Age of Discovery. Mercenaries may or may not return to PvP, this will most likely become a poll in the future. Guidhalls and their amenities will be locked to a undetermined expansion. We are still considering this. No prestige home portal or home UI will be available. Marketplace will be highly restricted and polls will be done to determine what will be available. Coin will also be returned to launch levels of coin gain. 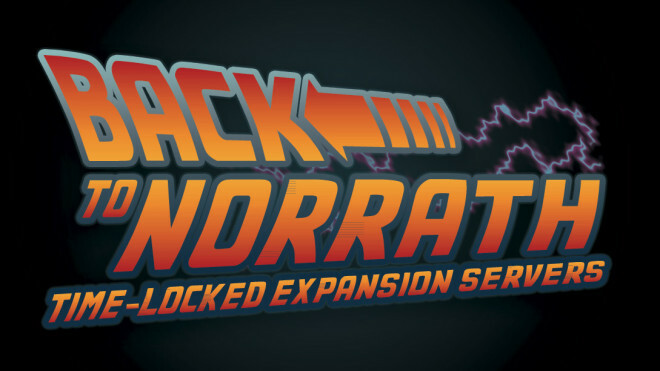 Adventure packs will be linked to specific expansions, still being determined. What will be the AA and level caps, levels and restrictions for the PvE and PvP Servers? There are going to be a few things we are going to allow you guys to vote on with in-game polls. We also can add additional poll questions as they come up and we deem them important for the player base to determine. Okay, so what will the polls involve and when can we vote? Polls will be coming in-game today, and the first poll will run until Tuesday, June 23. These will be touching on a lot of subjects. For instance, we have guild halls slated to go in with Kunark. We may do a poll that asks, do you want guild halls with Kunark? Do you want guildhalls at all? After this post, we will do our best to answer questions we see and also perhaps find additional items to add to future polls. We look forward to getting these servers up and running and are really excited to see what comes next! Approximate beta for TLE Servers is Jul 7th. Thanks everyone! lol, I lived through the first hell levels. not sure I want to go do it again, lol. Einelinea, I don’t think you will be able to start earning AA’s until the 2nd expansion KoS comes out and that could be a well over a year after the servers go live. I’m guessing they are not going to let you start earning them now and then spend them then day the aa’s go live. That would be to easy and they might as well let you safe up and bank xp. Wouldn’t it be the EoF expansion? You just recently left a survey that gave you the option to say no thanks I am happy to stay where I am but I could not leave it at that. I had to take the complete survey in order to even have that go though. I guess if an answer that is final is not acceptable, then I don’t understand why it is worded in such a manner. I have no interest in the survey with those terms. I should be able to say that I am not interested and be able to send that through without being forced to take the complete survey to tell you I am happy with things as they are. I think you should have that option. Thanks!!!!!! Same here, not only that but the pvp survey I could not complete, got all the way to 13/13 and it would not let me submit. Needless to say they needed to stop the survey if you did not intend on moving. I have no desire to relive it all over again but I’m glad that devs are going to make htis available to those who want this. Content will be locked to classic EverQuest 2, starting areas will be Frostfang Sea and Darklight Wood. It’s not going to be what people are expecting, its going to be exactly what the game is currently but expansion locked, no old zones, no old mobs (graphically) and no old gameplay. And that is why I have zero interest in going to the new servers. Same old game new rule set, and no original starting areas. After reading it, I have to agree. None of the stuff people actually want to go back for is in it. Well to be fair, they did say things within their power. I doubt old Qeynos and Freeport even exist anymore. Also they probably don’t want to do the Isle of Refuge either. The old cities don’t exist anymore but the original zones we leveled up in still do. It is entirely unfair to force us to start in Frostfang Sea and Darklight Woods when all the old leveling zones still exist and are far more enjoyable than the newer starting junk. All they would have to do is give the option to start in Qeynos or Freeport if you so desired. That is not hard, and in fact i believe was something they promised we could do on the normal servers and then somehow seemed to forget. There is no freaking reason they can’t open up Qeynos and Freeport as starting cities for us. I hate frostfang sea and don’t care for darklight woods either. If i’m going to start on this server i want to go straight to the old stomping grounds i ran when the game started. I don’t want to have to go cross country through red mobs just to try and get back to Qeynos so i can level up in the good content instead of the rush job that is the current starting areas. It’s not that the zones don’t exist.. it’s that much of the starting quests for those zones are now gone. I also think the starting zones should be like the original EQ2….the isle of refuge first…then choose Qeynos, Freeport or the other newbie zones… I really miss that. Really hoping they change their mind on the starting zones. Frostfang Sea is one of the few zones I truly hate. It’s like there’s nothing there but a straight forward path with some quests, all leading to a city at the top of a hill. And I’m pretty sure they still have the old Island zone, if not the quests on it, because of the Prismatic Weapon questline. It seems strange that a professional software company would not have all the work they’ve done over the years archived. The idea that the code “just doesn’t exist anymore” is nonsense. If it has been destroyed, that was a purposeful decision. It is more likely that the current employees cannot reconstruct the game as it existed then. If that’s the case, that’s fine but that’s what they should say. If they just don’t want to do it, then say that. If someone decided to wipe all the old code, then there is a name attached to that action and people should probably know, and expect an explanation on that basis. It doesn’t really matter in the long run but it is getting tiresome to hear things that sound like lies (or omissions of the truth) all the time, not just in the gaming world but throughout what passes for society these days. I used to come to EQ2 to escape a lot of that garbage, but at this point the games themselves fly the banner of their business side so high there is no respite from the corporate crap. I want my Newbie Island Freeport and Qeynos coins back, and my comfortable inn rooms in Starcrest Commune and Longshadow Alley. I’ll earn my citizenship later. What I don’t understand is how they were able to create the Isle of Refuge Prestige home if they no longer have the coding from the game’s earliest days. The Isle of Refuge was here at launch. NO guild halls! That is the number one thing that destroyed the social heart and soul of the game.